Taxol conjugation tg (Thyroglobulin bovine). Our Abpromise guarantee covers the use of ab26953 in the following tested applications. Antigen is coated on EIA strips at 0.4 µg per well. Antiserum is diluted in series from 1/10 to 1/10,000 and added in separate wells. Incubate the antibody for 0.5 hr. 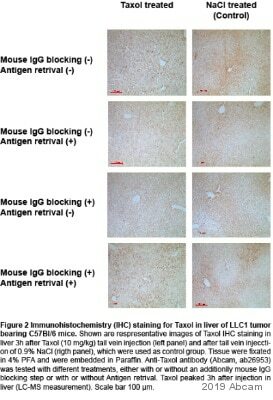 Wash off unbound antibodies and add anti-rabbit IgG-HRP conjugate. Wash the plates and add substrate to develop color for 5 min. Read absorbance at 405 nm. The intensity of the colour is directly proportional to the amount of antigen present. A positive is when the sample signal is double that of the control or pre-immune serum. Taxol (paclitaxel) is particularly effective as an anticancer agent because tubulin is not its only target. It also binds to a protein called Bcl2, which normally blocks the process of apoptosis, or cell death. Taxol therefore plays a dual role in destroying dividing cells,firstly by stabilising assembled microtubules and thereby halting mitosis, and secondly by inhibiting Bcl2 and allowing apoptosis to proceed. ab26953 has not yet been referenced specifically in any publications. Publishing research using ab26953? Please let us know so that we can cite the reference in this datasheet. To our knowledge, the anti-Taxol ab26953 has not been tested in immunocytochemistry. However by participating in our AbTrial program you can now use our products in an untested application or species without financial risk. 1. Reply to this email, letting us know you are interested in testing ab26953 in immunocytochemistry. The titre of this antibody as observed in indirect ELISA is more than 10,000. The below table show absorbance at 405nm using 0.4ug of antigen. HRP-conjugated anti rabbit ab was used. Antibody is positive at >2 folds of ABS of control/Pre-Immune serum. I would appreciate if you could confirm you are referring toTaxol antibody product code ab26953? I am sorry to confirm that as far as we are aware, ab26953 has never been tested in ICC. All tested applications covered by our 6 month guarantee are specified on our datasheets, and these are updated as soon as any new information is brought to our attention. If you would like to test ab26953 in ICC, please do not hesitate tocontactme againprior to the purchase by replying to this message as you may be eligible for our testing discount program. Through which position on taxol is the conjugate linked (i.e. position 2 or 7)? Does it matter if it's bound on a certain position through one side that may affect binding? Thank you for your inquiry and your patience with this reply. I am sorry to report that the lab hasn't tested to verify the position of the conjugate on taxol. They do not have this information. I regret that this information has not been very helpful, but please contact us with any other questions. Do you have any references for you Taxol Antibody, cat# ab26953? Thank you for your enquiry. Unfortunately, we currently do not have any direct references regarding the use of this product. All of our references come from loyal customers like you, who have used our products, published their findings in journals and later inform us of their publications. However, I managed to locate some publications on the subject that might contain useful information. Due to my limited access to journals, I was not able to check to see if they are relevant to what you are looking for. I sincerely hope that these journals will be able to provide some help. 1) Marone M, D'Andrilli G, Das N, Ferlini C, Chatterjee S, Scambia G. Quercetin abrogates taxol mediated signaling by inhibiting multiple kinases. Exp Cell Res 2001; 270(1):1-12 2) Amos LA, Lowe J. How Taxol stabilises microtubule structure. Chem Bio 1999;6(3):R65-9 Please rest assure that if the product does not perform in species and application as stated on the datasheet, and the problem (not protocol related) has been reported to us within 120 days of purchase, we will be more than happy to offer you a free replacement or refund. Should you require any other assistance, please do not hesitate to contact me. Our histology lab is ordering some abcam ab26953: Can you tell me if they is some exposure to this agent, is there any chance this agent could contain pathogens? I am also wondering if there were exposure, would our employees need to be followed up by a physician pursuant to the OSHA bloodborne pathogen standard. Thank you for any help you can provide. Thank you for your enquiry. Please rest assure that this product (ab26953) is an antibody, raised by immunizing rabbits with the Taxol conjugation tg. It is not the Taxol compound itself and would therefore not cause any health problems. This product is intended for research use only and not intended for diagnostic or therapeutic purposes. Should you have any doubts, please consult your nearest physician. I hope this information will settle your worries. Should you require any further information, please do not hesitate to contact me. Good luck in your research.